Goldenrod ~ taken with a zoom so I didn’t have to get too close! For the past week, my blogging has been sporadic. It has not been due to a lack of ideas or interest; instead, I have been a little under the weather with a sinus infection. My seasonal allergies flare up mostly in the spring and fall, but it is usually the fall when I experience the crud. I am not sure, but I think that Goldenrod is one of my culprits. 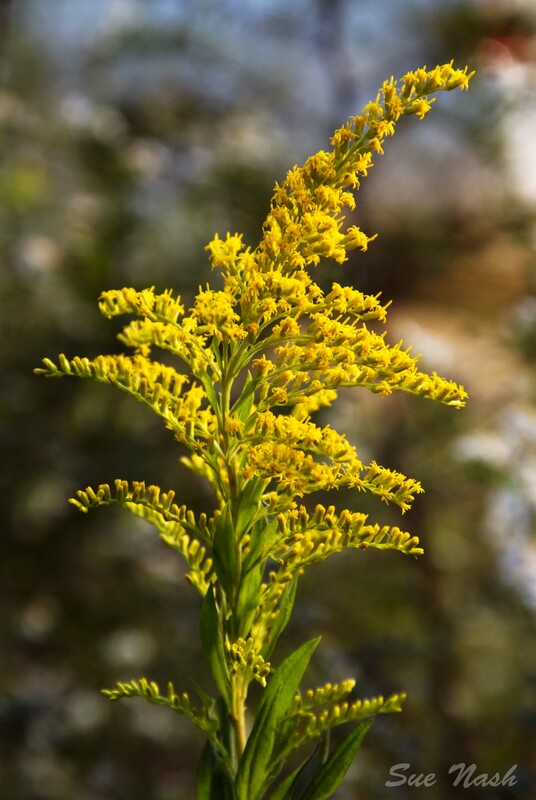 In Mississippi, Goldenrod blooms prolifically in fall. Their stark flowers brighten fields and landscapes with splashes of gold, but I try to avoid close exposure. If I stay outdoors near their vicinity, I get a golden headache! From a spiritual standpoint, there are things or situations that we should avoid, too. Of course, we should keep clear of overt sins, but what about those little ways in which we set ourselves up for straying. The danger signs are often as visible as Goldenrod, and we know we could get into trouble spiritually, but instead of shunning them, we draw near. We each have our particular areas of temptation. One I struggle with is gossip. A conversation about someone can start benign, but then rapidly deteriorate into bad-mouthing. What begins as simply discussing how a person is faring turns into an opportunity to criticize shortcomings. Before I succumb, the Holy Spirit always gives me a gentle nudge as a sign to refrain. He draws a subtle line to warn me to stop before crossing over into gossip. Sadly, I do not always obey. I am doing better, though, as God teaches me how to avoid this detestable sin. By heeding His clear warning signs, if conversations turn toward gossip, I either change the subject or walk away. And I try to not be the instigator! Since sin is so damaging to us spiritually, God lovingly places roadblocks to keep us out of harm’s way. He always offers us an avenue of escape. When I stay clear of allergy triggers, my sinuses are happy. When we heed God’s warning signs and avoid stumbling into sin, it pleases Him. This entry was posted in Random Thoughts and tagged Allergy, avoid, devotion, Goldenrod, Holy Spirit, sin, warning on October 27, 2013 by heavenlyraindrops. I really really needed to read this tonight. Thanks so much for sharing! You are welcome. Blessings on your weekend. Amen! The key is really paying close attention to God’s gentle warnings. Thanks. Beautiful thought and analogy,sis. So blessed read this. Thank you 🙂 Blessings. My biggest sin is generally not gossiping. I share things with my husband to get his spiritual advice sometimes on someone who needs prayer, but you just reminded me of something. Pride will catch us unaware everytime. A much older woman opened up to me the other day – and I was shocked to hear the bitterness and resentment that came out of her mouth. Not that I’m the best at discernment when it comes to people, but I never would have guessed all the pain inher that needs healing by Our Savior. I wanted to know more, so I kept asking more, even though the Holy Spirit poked me in the side so many times my ribs still hurt. I walked away feeling so convicted for the way I had handled the situation. Here I am, a child of The One True God, feeding into her misery and maybe fueling the fire instead of leading her to the healing Jesus works in our lives. She is a non believer, and I could have asked if I could pray with her! So anyway, I remembered I have a tendency to ALL sin – not just that in which I am tempted the most, or that which I recognize the most. Praise God that we are forgiven! PS – I am praying for God’s healing in your body. The bug going around is a tenacious one. I’ve had it 3 weeks or so – just finished round number 2 of antibiotics. blech. Take care of yourself. And to whomever reads this – please pray for the woman I mentioned above. We’ll call her A.S. God knows what you mean! Thanks for the comments and the prayers, Michelle. God is so very gracious to forgive us of all our sins. This habit of letting my mouth go too far, mostly out of a need for conversation, is always ugly. It looks uglier after I put it to print! But that’s a good thing to help me stop. I will agree with you for this woman to come to know the Savior. He Is Able! Thank you so much, dearest Sue! I think the closer we get to the Lord, and see His awesome holiness, we become more and more aware of our sins, even the “smallest” things … then, we get to see how much His grace increases!!! He is amazing, isn’t He?! 🙂 Thanks for sharing!!!! Have you ever tried raw honey to help resist allergies? Yes, but the thing that works best is when I have used the comb ( just a little ball of the actual comb and swallow it like a pill). Plus, it must be local honey. I wiped out a local beekeepers supply one year! Takes persistence, though. Thanks for the reminder!